Learning how to stop the vehicle in Emergency! When it comes to taking the driving test, part of the criteria may involve demonstrating the emergency stop or as it is sometimes referred to, the controlled stop. The emergency stop is a procedure that every learner driver must learn and perfect before taking the driving test. It’s a procedure that may be requested during your test, but more importantly, you’ll need to know how to stop the car quickly in an emergency once you have passed your test. Will I Need To Do The Emergency Stop On The Driving Test? You won’t know that your driving test will involve the emergency stop procedure until the examiner asks you during the test. Generally speaking, for every three driving tests that the examiner assesses, one of these will involve the emergency stop exercise. The Emergency Stop On The Driving Test! If you are a driving test candidate that the examiner has chosen the emergency stop for, at some point during the driving test, the examiner will ask you to park up on the left. Once the car is secured safely by applying the handbrake and selecting neutral, the examiner will inform you that they wish you to demonstrate the emergency stop procedure. The examiner will explain that shorty they are going to give you a signal to stop the car as though it was in an emergency situation. The examiner will inform of the signal for you to stop. This will likely be the examiner saying stop with an emergency stop hand signal which will likely be raising his hand palm away, just under the interior mirror. The examiner will also inform you that he will ensure it is safe to stop the car by checking over their right shoulder and not to anticipate the emergency stop and to wait only for their signal. 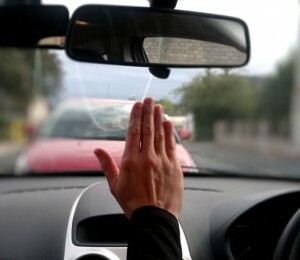 It is important that you wait only for the examiners emergency stop verbal and hand signal before you stop the car. The conditions may not be safe to do so otherwise. The examiner will conduct the emergency stop on a quiet 20 mph road. The speed at which the emergency stop is conducted will be close to or at 20 mph. If there are any vehicles behind, approaching from the front, cyclists or pedestrians at close distance, it is unlikely the examiner will request the emergency stop until all is clear. When the examiner give the emergency stop hand signal and voice command, as quickly as possible release the accelerator pedal and apply the brake pedal firmly, but ensuring you don’t simply stamp as hard as possible on it. Ensure you keep both hands on the steering wheel in your normal driving position. Keep the car steering straight and be alert for any signs of the wheels locking and developing into a skid. Do I Signal / Indicate For The Emergency Stop! A frequently asked question by learner drivers is whether they should indicate before or during an emergency stop. The answer is simply no! In a real-life emergency stop, a driver will not have time to indicate, plus a driver must have two hands on the steering wheel to maintain full control. If you were to indicate intentionally during the emergency stop, it would likely fail your driving test. After the emergency stop however, you may indicate your intentions to move off by indicating if necessary. An important aspect of the emergency stop exercise is to depress the clutch at the very last moment before you stop. Depressing the clutch too soon or at the same time as you press the brake is called coasting. Coasting reduces the effect of braking because the clutch is pressed, therefore disengaging the engine. Once the car is stationary, apply the handbrake, select neutral and release your feet from the pedals. The examiner will now inform you that they will not be asking you to do that again and to please move off when you are ready. When the car is ready to move off, ensure you perform all the correct observations. The emergency stop may have resulted in your car being stationary in the middle of the road. If this is the case, look into your left blind spot as well as your right one before moving off. Mirrors – checking the mirrors before applying the brake. Coasting – applying the clutch before the brake, at the same time or much sooner than it should have been. Wheels locked and skidding occurred but was unable to gain control. On the examiners emergency stop hand signal, release the accelerator pedal and depress the brake pedal as quickly as possible. You will need to apply firm pressure to the brake pedal but avoid pushing it down too hard as it may result in the wheels locking up and a skid occurring if the vehicle isn’t fitted with anti-lock brakes. Emergency stop with anti-lock brakes! On good road conditions and in good, dry weather conditions, apply the foot brake firmly and keep your foot firmly and consistently pressed on the pedal until the vehicle stops and the handbrake is applied. You will not skid as the ABS will prevent this. ABS is an excellent safety feature that in most cases prevents the wheels from locking and therefore allowing the driver to steer and maintain control. There may be certain conditions where wheels may lock and skid even if ABS is engaged. Loose road chippings or a particularly wet and slippery road surface are example of such conditions. Therefore you will benefit from practicing the emergency stop to brake quickly, but to avoid ABS fully taking over. Slightly easing off the brake pedal should disengage ABS. You’ll know when ABS engages as you should feel a pumping sensation through the brake pedal. Once ABS is disengaged, quickly and progressivly reapply the brake pedal. Plenty of practice will allow this process to become easier which is especially important as you may be required to perform the emergency stop during wet conditions. Emergency stop without anti-lock brakes! If you are taking the driving or learning to drive in a car that was made before July 2004, your car may not have ABS. Apply the brakes very firmly but try to avoid stamping on the brakes fiercely as this is likely to produce a skid on a car without ABS. Gauging the correct balance between stopping as quickly as possible but avoiding a skid takes practice in a car without ABS. You will notice if you begin to skid as the tyres will begin to shriek. A skidding car is unable to control speed or direction. If you manage to depress the brake pedal too aggressively and the car starts to skid, slightly release the brake pedal and depress the pedal once again. This action is called cadence braking and should cancel out the skid and regain control. Providing you manage to stop the car from skidding, regain control and still manage to stop the car promptly, all should be good for still passing the driving test. Skidding And Anti Lock Brakes / Abs! If your vehicle is fitted with anti-lock brakes (ABS), there shouldn’t be too much of an issue with skidding other than certain conditions detailed above. It is important to know if your car is fitted with ABS as without, you will need to understand the cadence braking technique. If you are taking the driving test in an instructors car, they should inform you if their car is fitted with ABS during driving lessons. All new cars following a European Union mandate from July 2004 made all new cars to be fitted with anti-lock braking systems. Unless your instructor has an old car, it’s highly likely it will have ABS. However, it’s important that you understand the correct technique for stopping a car in an emergency with and without ABS as your first vehicle purchased after you pass the driving test may not have ABS. This emergency stop tutorial explains both procedures. For further information on anti-lock brakes, how they work, how to use them, the benefits and disadvantages plus other information, see anti-lock brakes. Emergency Stop – Wet Road! There is a possibility that the examiner will ask you to perform the emergency stop if the road is wet. There is a higher chance of a skid developing and the cadence braking technique should be familiar in this situation. An emergency stop isn’t going to take place in icy conditions or conditions of poor visibility ad the test will be cancelled due to such weather conditions. It will make no difference to the examiner if you take the driving test when pregnant or how many weeks. Their view of the situation is that pregnant women still need to stop the car in the event of an emergency, not only for others sake, but of course for themselves too. Just as with a manual transmission car, once you have come to a stop in an automatic car after the emergency stop, apply the handbrake and select park.